Today was a "picture perfect" day at Epcot. As I was walking across the bridge between France and the U.K., I noticed a Friendship boat making its way across the World Showcase Lagoon. 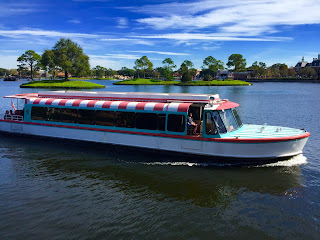 These 100 passenger vessels can be found here, as well as on the water ways that connect the Epcot resorts to Hollywood Studios and Epcot. Although you can typically walk in the same amount of time, the Friendship boats are a nice way to move around the area.